I. sindjarensis, Boiss. et Haussknc. in Boiss. Fl. Orient, vol. v. p. 422. 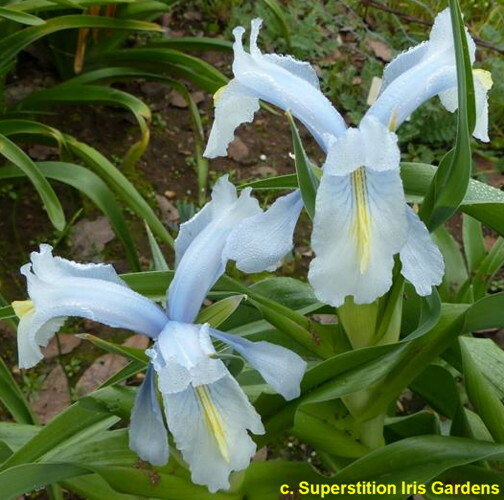 This is another of the bulbous species of Iris allied to caucasica, orchioides, and palcestina. It is distinguished by its short stem, crowded green lanceolate leaves, and lilac flowers. It was discovered about 1865 in Mesopotamia by Dr. Haussknecht, in one of those journeys which have added so much to our knowledge of Oriental plants. Much later it was introduced into cultivation by our esteemed correspondent, Herr Max Leichtlin of Baden Baden ; and our drawing was made from a plant which he sent to the Royal Gardens which flowered in a cool frame last February. Rootstock an oblong bulb, with cylindrical root-fibers; outer tunics membranous. Produced leaves about eight, crowded, lanceolate, distichous, acuminate, firm, bright green, an in broad. Stem very short, hidden by the leaves, bearing one or two clusters of flowers; spathes two inches long; outer valves lanceolate, pale green at the flowering time. 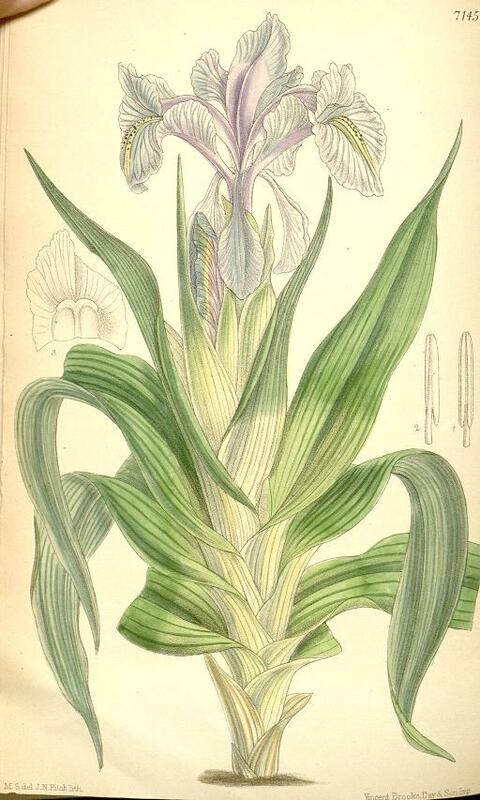 Perianth slaty lilac; tube protruded about an inch from the spathe; outer segments oblong cuneate, two inches long, under an inch broad, slaty lilac with radiating lines of darker lilac, and with an inconspicuous yellow crest down the lower two-thirds; inner segments oblong-unguiculate, an inch long, drooping from between the claws of the outer segments. Style branches half an inch broad; crests ovate, imbricated, reflexed."